Computational biology – also known as bioinformatics – is an interdisciplinary field that involves the use of computational technology to gather, store, analyze and integrate biological and genetic information. 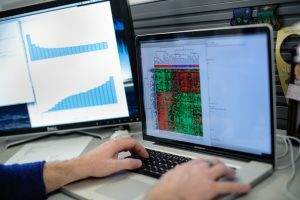 HudsonAlpha computational biologists perform deep computational analysis and interpret vast amounts of data, a critical role in the science of genomics. Since bioinformatics is the science of collecting and analyzing complex biological data and genetic code, the field includes of a wide variety of scientists at HudsonAlpha, including biologists, software developers, clinical analysts and geneticists. In every HudsonAlpha lab, scientists specializing in bioinformatics develop and use analytical and theoretical methods, mathematical modeling and computer simulation techniques to study biological systems and enable the incremental analysis required to process the large amount of data generated in a high throughput laboratory. In particular, the Software Development & Informatics Team at HudsonAlpha has created a new clinical software tool for the interpretation of whole genome sequencing data. This technology can identify mutations that are responsible for rare and common disease, help patients end their diagnostic odyssey and avoid misdiagnosis, predict the likelihood of future disease development, and help identify which drugs will work best for individual patients.